I ended up spending slightly more on the bike than I thought I would. I figured that going for a slightly newer and better model than i was going to, and getting it from a dealer would help the bike last longer, and be a little more modern in terms of the features (it has a clock, which apparently is a real bonus!). I anticipated buying a few items, but then realised how much more there is. Helmet, boots, gloves, jacket, trousers, scarfs, ear plugs, visor cleaner, bike cleaner, oil, brake fluid and coolant. In comparison to the train, it’s more of a similar cost than I originally anticipated. The helmet took me several sessions to find, and I was comparing the Shoei XR1100 with the AGV GP-Tech for a while, trying each on quite a few times before deciding. Once you take it out the shop, there’s no taking this sucker back!! They compared well, and the differences were minimal. The tightness of the padding around my face was the main reason I went with the AGV GP-Tech in the end. 3. What feels right, probably is! I researched for a month or so to find the right bike. It was a battle between getting the bike I wanted, and being able to pay for the insurance. So the trade-off began. 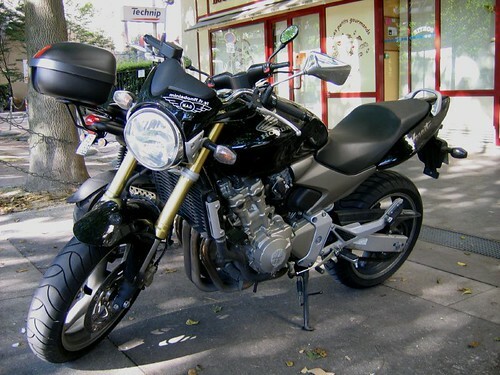 I honed in on the Suzuki SV650, which although I thought looked nice, once I sat on it I realised that the sports style bikes weren’t going to be as comfortable. The dealership had a few naked style Honda’s in too, and once I sat on the Honda CB600F, I realised how nice it could be to ride. After a test ride, it was mine. And after a month of commuting on it, I feel like I made the right decision. Easy to ride, comfortable and a good riding position. It also has the option to add a topbox onto the back, which would provide additional storage if needed. The first thing i learnt is that noone sees you, except perhaps other motorcyclists. This is especially true of van drivers without back windows, and frustrated car drivers looking to bypass the traffic. You have to be so mindful that people aren’t expecting you to be there, and be prepared to get out the way if they do something unexpected. 5. I really don’t want it to break! Unlike any other vehicle I have owned, this is one which I feel I should take more care of, and look after better. I’m quite happy not to check the oil in a car I own for hundreds of miles, but I am trying to keep a regular check on all parts of the CB600F, just to make sure that it’s running in good order. I’m clocking up the mileage quite quickly, with a combined journey of around 100 miles per week, along with the occasional pleasure trip, and getting to know the area. It’s brought a completely view for me to how London is connected, and opens up so much more in terms of getting around for less. Keep tuned to find out how I get on with my various motorcycle adventures in the future.